Seniors at Puyallup High School participated in the 2018 Decision Day on June 1. The ceremony celebrated the soon-to-be graduates, honoring each of their plans after high school. Whether transitioning to a chosen university, going into a branch of the military, starting an apprenticeship, or joining the workforce, these seniors were celebrated for their years of hard work in academics and plans for the future. After the ceremony, seniors in caps and gowns stood in front of the school with hands full of confetti and hearts full of excitement as they cheered for one another and themselves for their years of dedication. Buses then took seniors to the nearby junior high schools for their Senior Walk. 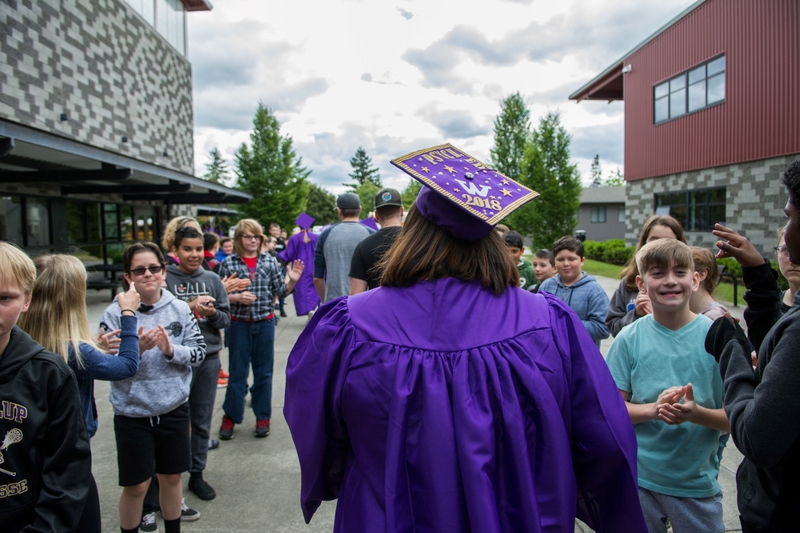 Students and staff from Aylen, Kalles, and Edgemont Junior High lined the hallways cheering on the high school seniors for their achievements. The seniors smiled and waved at the younger students, reminiscing of a time when they had once been junior high students in those same halls. As the junior high students applauded and cheered the seniors walking in full cap and gown, inspiration was in the air. The junior high students watched in admiration as if imagining themselves returning to their junior high someday to continue the senior tradition. Rogers High School and Emerald Ridge High School celebrated Decision Day on May 1. Click here to read about the RHS and ERHS Decision Day. Graduations for all Puyallup School District high schools will be live streamed again this year to the PSD YouTube Channel. Click here to see more details about the 2018 PSD Graduation Ceremonies.